In September and October this year my friend and I went to Tamil Nadu to volunteer as english teachers and to work with a small NGO, ODAM. The Organisation of Development, Action and Maintenance envisions "Establishing equality among human society" irrespective of caste, creed, gender, region, religion, language or politics. To translate this vision into action, ODAM works on issues such as: rural poverty, women's empowerment, child welfare and environment. Why did we go? This was our second trip becuase after our first one we felt committed to returning to demonstrate a human connection and to see our girls growing up. But the first time we went was a matter of opportunity. After more that 15 years working for the Government I had long service leave and my plans then included traveling. I had 6 weeks in my program to fill in and volunteering somewhere in India made sense - it would be a cheap 6 weeks, and give me an opportunity to try something different. I don't have children, and my husband doesn't get as many holidays as I do - so it makes sense for me to give my time through volunteering. Volunteering allows me to share my skills and knowledge with an organisation that may be poor on human resources. It also provides me an excellent opportunity for personal and professional learning. At the moment, I am committed to volunteering as a learning experience instead of enrolling in my PhD which would demand me to compromise some of my values. How did I choose ODAM? There are many hundreds of agencies that happily take volunteers. There are also many who charge you for the experience. Many others work towards their own set of values and beliefs. Finding an agency or opportunity that was affordable, and fitted well with my own beliefs were two of my main selection criteria. I wanted to work towards the empowerment of women and against violence, I didn't want to be involved in 'pushing' organisation values or religious beliefs on anyone I would be working with, and I wanted to learn about a new culture. Finding ODAM (on Idealist) was the answer. In early correspondence with the volunteer coordinator at ODAM I asked lots of questions about what work they do and how they could use me. I appreciated the way they responded, and my friend and I eventually agreed we could go as English teachers. Would I do it again? I'd definitely volunteer again. And I'll promote ODAM to anyone who will listen. This is just the first of my reflections on volunteering. I will post more soon about my experiences in India, the challenges and lessons I learnt and how it changed me. Girls playing the senses game. Today has been probably the first day since returning from India, that I've been about to get out to the garden and enjoy being covered in dirt. It's been gorgeous. Today's been pretty rainy, but that was great weather for my job - weeding and turning. While I was away, my partner efficiently kept the broccoli and spinach going by eating it regularly. But didn't effectively manage the over growth of the older and spreading plants. So today I had the fun of pulling huge old celery bushes, and pruning the wandering native spinach, and tossing the old broccoli bushes to the compost. The compost is now HUGE. Since pulling up the old stuff, I can now see what space I have to work with, and can start planning my next round of planting. Maybe next weekend will be a good time to start on that! I must blog my reflections on life as a volunteer with ODAM in India. My 6 weeks as a volunteer is now quickly fading into the past, but I feel like there were some really important lessons for me there. I'd like to blog about these soon. I must also blog about D-Impact.org.au - my friends who are now working in the village I went to. I'm following their blog with interest, and learning more about the philosophy of designing for the 90% of the population, rather that the top 10%. I also recently read about 'reverse innovation' - an aligned philosophy, but with a twist... more to blog about there. This morning I read Riana's blog about 'lists' - so I was thinking in the garden about my need or use of lists. I also loved her review of a typical day, and wondered what my dream typical day would be?? I'm growing an experimental Yacon - so I was watching how it grows, checking out any signs for pests and wondering when I would get to dig for the fruit? Finally, I had a quick reflection of my blog and noticed it's been quite a while since I shared with you a tea cup. This little one joined my collection from Limoges in France. I love fine china, but when I was in Limoges I was riding my bike. So collecting some nice everyday pieces wasn't going to be easy. I found this little one and just love it. Again, Murakami has intrigued me and challenged me in new ways. Once I got into this book, I did find it difficult to put down. 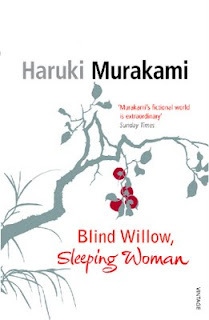 I was intrigued from the first time I saw the cover - it's just so beautiful and elegant - which are words I'd use to describe some of Murakami's short stories included in this work. I started collecting Murakami novels during the Japanese Literature Challenge 2, hosted by Della Belleza. It's since waited on the shelf for this years JLC3, but didn't have to wait long before I picked it up. The back cover says 'Here are animated crows, a criminal monkey, an ice man, as well as the dreams that shape us and the things we might wish for.....Murakami's characters confront loss, or sexuality, or the glow of a firefly, or the impossible distance between those who ought to be closest of all.' For me, this collection of short stories were a powerful reminder of the things (real or imagined or hoped) that I've lost, and the meaning these experience are given (or not) in my life. Imagine losing your identity to a monkey with an infatuation with names? Shanghai Monkey (the last story) powerfully and poignantly questions "what's in a name?" "What is your identity?" "What defines who you are and how you behave?" For me, does my name, or my profession, or my religion or my suburb define me? - or can I exist with out any of these identifying features? Man Eating Cats got it's name from a short piece in the newspaper about a woman who lost her life, dying in her apartment, and then she lost her flesh from the cats she kept in her apartment. It's really a story of men and women, relationships, marriage and loss. The author and his girlfriend lost their marriages, and moved away from Japan - perhaps essentially losing their real identities as Japanese people? In the end when the author looses the girlfriend, in true Murakami style, in what seems like a surreal dream. After searching for her, he realises he may as well be dead and eaten by man eating cats, because he had lost the 'real me' and now also the 'provisional me'. More questions are raised for the reader.. I cant tell you which short story was my favourite, they were all pretty deep and challenging. I did limit myself to one short story a day, to allow myself time to process the significance and also the stupidity of some of the stories. Imagine vomiting for 40 days, every day trying to locate the reason and considering the conspiracy theories, only for it the end suddenly, and not to ask 'what did I learn from this?' When Murakami asked his friend (who had suffered all this) this question all he got in response what 'how should I know? '.